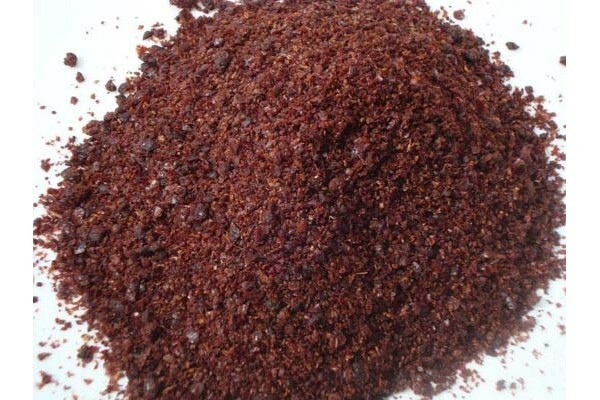 The finest quality ground Sumac. Sumac spice comes from the berries of a wild bush that grows widely in Mediterranean areas especially southern Italy and parts of the Middle East. It is widely used in Arabic cooking often used in preference to lemon to provide sourness and astringency. Many varieties of Sumac occur around the world. In Arabic cuisine its is used as a garnish on meze dishes such as Hummous and is added on salads in the Levant. In Iranian (Persian and Kurdish) cuisine sumac is added to rice or kabob. In Turkish cuisine for example it is added to salad-servings of kebabs and lahmacun. In North America the smooth sumac (Rhus glabra) and the staghorn sumac (Rhus typhina) are sometimes used to make a beverage termed "sumac-ade " "Indian lemonade" or "rhus juice". This drink is made by soaking the drupes in cool water rubbing them to extract the essence straining the liquid through a cotton cloth and sweetening it.